Emery County officials are seeking out hosts through Airbnb and other vacation rentals to meet the need for lodging in the northwest part of the county. Recreation tourism is booming in that area, where the economy has traditionally been focused on mining. Here is a screenshot of some of the latest Airbnb listings for the area. Airbnb-style rentals may have been treated as a scourge in some cities around Utah. But one county is urging residents to fix up their mother-in-law units, spruce up their vacation homes and roll out the welcome mat to tourists. Emery County officials are promoting short-term vacation rentals like Airbnb, especially in the western half of the county, where outdoor recreation is exploding and bringing thousands of tourists each year. Near Castle Dale, in northwest Emery County, Joe’s Valley is becoming a world-famous rock climbing and bouldering destination, attracting some 15,000 visitors each year — but there are only 40 motel rooms in the area, Leonard said. Price, an hour away in Carbon County, is reaping most of the benefits of growing tourism. 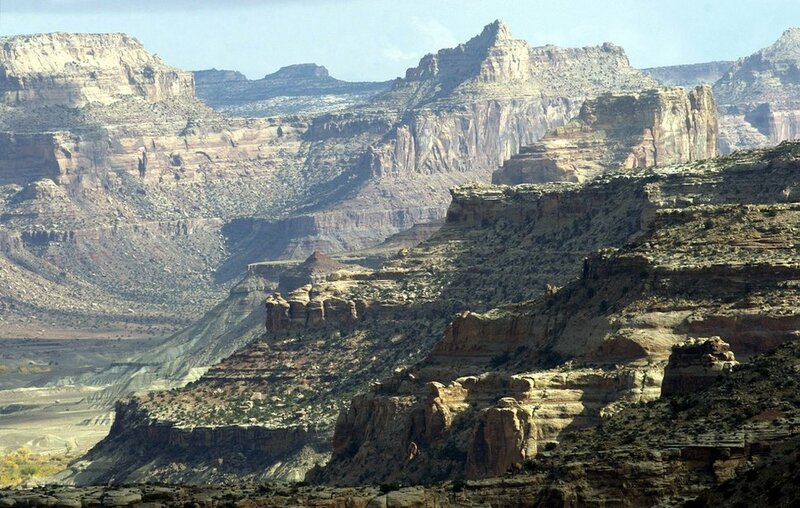 (Al Hartmann | Tribune file photo) Towering layers of sandstone cut by water and time near the Wedge in the San Rafael Swell in Emery County. Emery County began promoting vacation rentals to residents about two years ago, by word of mouth and at community meetings — a dramatic deviation from the typical script on short-term rentals in Utah, where local governments have aired fears of party houses, zoning free-for-alls and housing shortages. In Moab, St. George, Provo, Park City and several other towns, nightly rentals are restricted or banned. Salt Lake City has fielded objections to them as it re-evaluates its rules on mother-in-law apartments. Meanwhile, Leonard celebrates each new rental as a victory. Merlin Weber was one of first to hang out his digital shingle, opening his 1894 “Nielsen House” as an Airbnb in 2016 in Ferron, a town of about 1,500 people just south of Castle Dale. Since then, two other vacation rentals in Ferron have been listed — but Weber’s traffic hasn’t gone down. He typically gets two or three groups per week from March on. 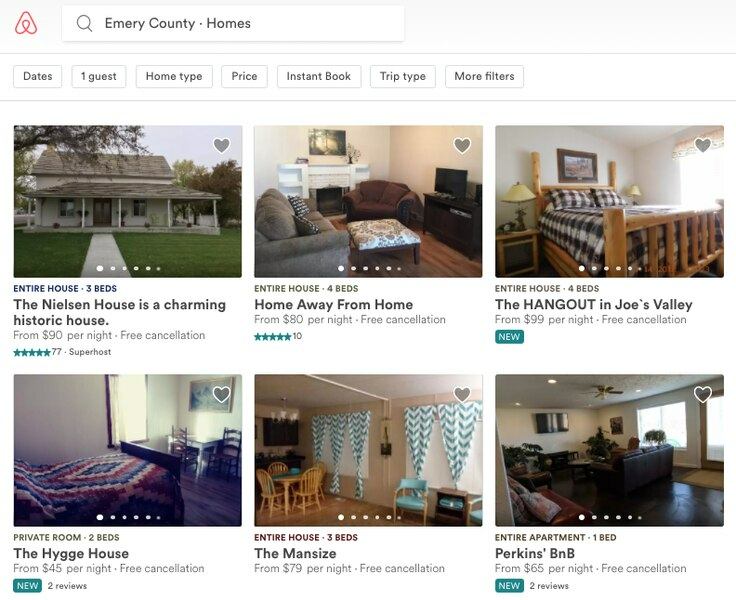 Airbnb rentals in Emery County generally range from about $50 to $100 per night. Initially, Weber’s guests were mostly climbers from the boulders at Joe’s Valley, about 20 miles away. International climbers in particular need lodging because they aren’t flying over with camping gear, Leonard said. Weber has hosted visitors from China and a number of European countries. Now, Weber said, he’s also getting more tourists who want to go somewhere rural — and some who specifically want to flee the crowds in Moab. But Weber says a few more amenities wouldn’t hurt. In Ferron, he said, there is one drive-in restaurant, and the lone gas station recently closed. “It would help if we had a little more commerce,” he said. Emery County’s population has declined about 7 percent since 2010, most of the losses coming from the western towns, where mining employment has dropped by about two-thirds over the past decade. Weber is familiar with the fights other communities have had over short-term rentals — “I own a house in St. George,” he said, noting that many there are militant about “not wanting to have Airbnbs in their neighborhood” — but he says his experience with his renters has been uniformly positive.